Is everybody ready for the weekend??? WOO HOO!!! I am! It's normally not any different than a weekday for me, other than the fact that Robert is home, which I love! However, we have yet another birthday party to attend on Saturday, which just happens to be a "double-header" of sorts - LOL! Yes, a double celebration for both Robert's dad (I call him Papa) and one of Robert's sisters! Nani's birthday is ACTUALLY on Saturday and Papa's is on Monday! I just LOVE family get-togethers as EVERYONE always has such a GOOD time and VERY fond memories are made at each event. YES, I will be taking photos. Good griefess (not in the dictionary, but I like it! ), I still have not done much with all of the photos from Mama's birthday bash three weeks ago! Am I slipping, or what? I'll take the "or what"!!! ROFL!!! Okay, you guessed it ... I'm running on RUM-DUMMY as it is DEFINITELY past this girl's bedtime! 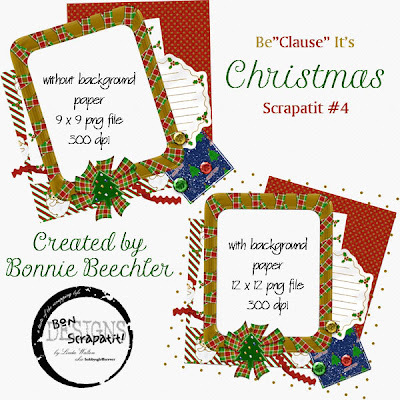 Tonight's FREEBIE is, none other than, Scrapatit #4, WONDERFULLY created by Bonnie Beechler using my *Be'Clause It's Christmas* scrapkit!!! I just LOVE it when she surprises me with her INCREDIBLE talent! Bonnie created this "scrapatit" so that you can place it on a background of YOUR choice - HOW clever is that!!! I've also included a duplicate copy of the PNG file, only I've added a background paper for those who are new to digital and may find it MUCH easier already put together! All you need to do is place your photo behind the opening and VOILA, instant scrapbook page!!! Thank you Bonnie!!! You ROCK girlfriend! ENJOY and by all means, SCRAP HAPPY!